Debt is four-letter word. “It’s remarkable,” says McNary, “how four little letters, d-e-b-t, pack such a wallop.” Happiness depends on how soon you face your debt: the sooner, the happier. Debt takes many forms. Some debt, such as intricate tattoos or high-end cars, is fun to amass. Other debt, illness, unexpected job loss or divorce, is disastrous. Fixing fun debt demands willpower, a change of lifestyle and mindfulness. Fixing disastrous debt calls for self-disciple, patience and time. Debt grows without rain is an old Yiddish proverb. Interest on interest means you fall deeper and deeper the longer you go. “When you decide to use your mind, not your emotions, you take the first step out of debt,” says McNary. Decide is the word. McNary echoes Richard Bach in advising clients to stop buying fancy and pricy drinks at that self-proclaimed high status coffee shop. Buy a home coffee-maker; stock up on k-cups from a bulk box store. First year, the savings will be at least seven hundred dollars. Although leasing means a car with more bells and whistles, for the same monthly payment, than if you buy, McNary says buy. At the end of the lease, you have nothing. When you buy, you have a car when the payments end. McNary supplies a worksheet that reviews income and spending. Among basic needs, McNary lists savings and a Roth IRA, which, for Americans, grows tax-free, before food and rent. The biggest shocker may be the net income minus spending box. McNary is not preachy, as are many authors proclaiming to help you handle your money. She doesn’t promise riches. Yet, you may become rich following her advice. An irreverent guide to handling your money. 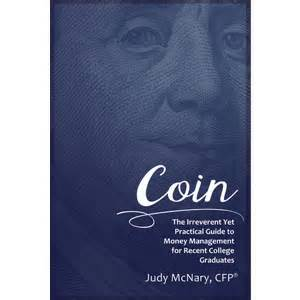 Judy McNary (JM) “Coin” is for recent college graduates and anybody in their twenties, mostly, that wants to get an understanding of how to manage personal finances. In a quick, engaging way, “Coin” helps readers put financial fundamentals in place and then get on with his or her life. GS “Coin” has much to offer those of us born with a plastic spoon in our mouths. JM The book has a target, but, if its appeal goes beyond that, that’s better. GS What motivated you to write “Coin”? JM Well, right now it’s what my husband, Scott, calls my expensive hobby. I’m a financial planner; from that come two reasons for “Coin.” First, I have three children in their early twenties, the usual pack of nieces and nephews as well as some young-adult clients. My impression is my children, relatives and clients want to plan finances, correctly, as they start out. They see the first few years as a special challenge, finding jobs, starting careers or families and so forth. They want to limit novice mistakes as well as not repeating mistakes made by their parents or others they know. “It” was subprime mortgages, huge credit card balances, expensive holidays, cars they didn’t need and so forth. These women and men are not stupid or greedy. Opportunities presented, as reasonable, so they took the plunge. At the time, the financial opportunities made sense. When circumstances changed, regret soared. These women and men didn’t understand the importance of putting twenty per cent down on a house, for example; no home equity seemed as free money to them. You must have some equity in your home. These clients financed one hundred per cent because someone, working on commission, probably, let them. They did it without realising the risk; no equity is an easy way to lose your home. This, I thought, was another vacuum “Coin” could fill. I thought that when people are young, before they make a huge mistake, is the right time for a financial planner to have the most effect. We learn from our mistakes. You can learn as much from little mistakes as huge mistakes, if you’re paying attention. I wanted to catch young people before they made a huge mistake. I wanted to get them rolling, on the right path. I wanted to help make them financially secure, without preaching, without giving them the sense they were missing something or giving up too much. Money is good. Still, money carries much baggage: emotions, anxiety and fears that stress us. I want to convince young people they can be financially wise and secure without becoming Ebenezer Scrooge, a mean-spirited miserly man. JM Gratitude; I have a great life, great kids, a great marriage, great friends, a great place to life and so forth. There’s much for which I am grateful. JM Bitter, it’s the least desirable trait and implies the opposite of gratitude. Ease of credit a problem. GS Is easy access to money the trap it seems. JM I think the ease of credit is the problem. My children received applications for preapproved credit cards when they were babes in arms. It’s crazy. GS My long-deceased parents receive applications for preapproved credit cards, all the time. JM A Water Park, near the town where I live, has a yearly end of the season event for dogs. It’s bedlam; the German Shepherds are barking, madly, trying to line up the other dogs. The Border Collies successfully herd everyone, dog and human, into a small corner of the park. Easy to get credit card for students. Local businesses provide prizes and giveaways. I signed up my dog, Apollo, for a giveaway from First Bank. The following week, First Bank sent Apollo an invitation to open a bank account. GS Next, he will receive a preapproved loan application for Apollo. JM I am sure, how absurd. JM Creativity, when I can make something from nothing or something new from something old. There’s great intrinsic satisfaction in creating. JM A “No can do” attitude. Far more often than not, there’s a way to solve a problem; to get out from under a pile of debt. If there’s a will, there;s a way. A “No can do” attitude probably reflects laziness. JM Shite as in poop, but I must be most upset for the word to fit what I intend. GS Credit cards are part of the easy money problem. Only thirty-five per cent of credit cardholders pay off their cards every month. Is that figure true. GS Have you looked the Office of Management and Budget (OMB) online data? JM At first, I admit, I didn’t realise the depth and breadth of the problem. Almost eighty per cent of US households have at least one credit card. Typically, Americans with one credit card have three or four cards. Total outstanding credit card debt, in July 2012, was more than $13,000 for each person with a credit card. Many men and women need help. GS Given median household income is $50,000, twenty-six per cent of that is on credit cards. That's debt, dug deep. JM Yes and keep in mind student loan debt is fifty per cent greater than credit card debt, at roughly one tillion dollars. I didn’t understand how clients find themselves in such a crisis, until I asked and look. I thought I could help, which was not always true. GS How did these people get in so deep? JM For one, they refinanced they homes, repeatedly; they had no equity in their homes. They’d go on spending frenzies and not honestly know why or exactly what they bought. “Everybody else is doing it, why not me,” was a common reason. Debt problems likely keep these women and men up at night, but they won’t tell anyone. It as if it’s shameful. A financial counsellor could likely help them, a lot, but they avoid help, it seems. GS That affects, silently, the long-term health of individuals. JM The 2008 financial meltdown, the resulting recession and slow economic recovery had one good result. Many women and men swore they wouldn’t fall in to such bad financial holes, again. As well, others saw so many friends, parents, even strangers in financial trouble; they swore to avoid it. GS There’s a bright side to most negatives. JM Yes, the OMB is now showing stronger numbers. More people are saving more money and trying to reduce their debt load. Some women and men learned a lesson. GS Too much saving hinders economic growth. JM True, but the idea is to balance saving and spending. This means having a budget. This means sticking to the budget. This means living on less than you earn. GS Are you confident the lesson learned between 2008 and today is going to stick. JM No, I’m not. I wish I could be confident. I started hearing radio commercials for mortgages aimed at those that can’t qualify. I’m sure everyone hears the same commercials promising a mortgage for those with poor credit, no money down and so forth. GS I used to hear a similar radio commercial promising credit, even if the listener was in jail. JM Those commercials make me cringe. The advertisers are trying to restart the financial distress cycle, especially for individuals. I am sure, some people, some smart people, will break down and try these financial products. JM Yes, I’m a hopeful person, always. For me, it’s worth the effort to get the correct message out. Avoid debt best you can. When men and women have good, financial basics engrained, at a young age, habits form. These habits usually stick and help avoid problems. Parents must instill this value emphasis. I have clients at the other end of scale. They have never had high paying jobs, never had any inheritances, lottery wins or stock benefits that were worth anything. Still, they diligently saved and invested. These clients took advantage of 401Ks and IRAs. Now, in their fifties or sixties, they’re retiring with several million dollars. Financial planning does work. These men and women did nothing extraordinary. They’ve lived within their means, invested what they could. Today, in their late fifties, they’re in great shape. They don’t have pensions. They had to take charge of their own finances. They started early, which is important, but it’s never too late. GS I understand it’s easier for students to get a credit card than for those of the same age that are working. JM Yes, in the US, at least, it’s easier to get a credit card while you are still a student than it is when you’re out of school and newly working. So there’s a window. There’s a temptation, too. GS No doubt, I got my first Visa and Master Charge when I was a student, more than forty years ago. Why is that? JM I’m not sure. I don’t know if the credit companies assume mom and dad will cover a student. If you’re out of school, 23, say, working, but no credit history, a credit card is almost impossible to get; maybe a prepaid card. GS Reading “Coin,” I got the impression only those that can pay off the monthly balance, in full, should have a credit card. JM Yes, paying off the monthly balance is a shocking idea for many. They don’t realise how fast the balance builds, how interest on interest on interest adds up. Credit card companies like to increase maximum spending limits, as the outstanding balance increases and some on time payment made, most of the time. Credit card balances soar, as if by magic. GS Cardholders keep spending up to the new limit. JM Yes, the balance goes from one hundred to five hundred dollars, quickly. Then to eight thousand dollars and fifteen thousand dollars before the cardholder realises what’s happening. There’s a point where the cardholder stops opening the monthly statement. GS It’s crazy how it happens. JM Many people think of a credit card as free money. That’s the problem. Some people need a bigger wake up jolt than do others. GS Years ago, the wife of a friend told me she spent much more when using a credit card than when using cash. GS The credit card is the worm on a fishhook. JM Yes, I know what different jobs pay and how much money people have, without going into debt. Too many young people act as if they’re characters on a sitcom that think a mountain of debt is okay or normal. I wish pop culture stressed that is was cool to be financially solid, but it doesn’t; financially messed up is much cooler. GS These television shows can teach a bad lesson because jokes about losing seem to work better than jokes about winning. JM Yes, it helps create a mindset that persistent overspending and being deeply in debt are okay. The compensation for a starter or low-end job is that debt makes up the difference. It’s a gross deception, a disservice. JM Watching people take chances, as they trying to realise a goal, without acting foolishly. Home Equity is important and necessary. GS In “Coin,” you advise twenty-to-twenty-five per cent of gross monthly income should go to housing. JM Yes, that’s a sensible amount to estimate. GS The New York “Times” recently reported this number has risen to thirty per cent. JM I agree, if you live in Los Angeles, San Francisco, Boston, North Dakota or New York City, at least thirty per cent of gross monthly income goes to housing. That number is creeping up in many places, creeping up faster than incomes. Still, I’ll hold to my original number for most places in the US. GS Housing is an important part of the advice you offer. JM When I talk about finances, with new clients, I always ask about housing. Too many think being on their own, away from their parents, means their own apartment. When someone is starting out, a room-mate is often a wise idea. Recent college graduates have student loans to pay off. They’re often in starter jobs or part-time jobs, waiting for career entry. Money is at a premium. I appreciate many twenty-somethings don’t want a room-mate or surrogate sibling. Financially that’s exactly they need. I believe that’s necessary. GS Maybe live with your parents. JM Yes or live with your parents. If you have some specific reasons, to pay off student loans, say, or to build emergency savings and get your footing, staying at home is a great way to do it. If it works for everyone, involved, it’s a good alternative. Not everyone finds adult children’s living with their parents is a good solution. Children leave for college at 18, with one world view. They return home, to their parents, at age 23, say, with a different world view. Maybe the adult children had studied overseas or worked, while going to school, which can change one’s outlook a great deal. It’s good to throw off the child parent baggage. It’s good to connect in a different way, as adults. Sometimes it doesn’t work, but it might be worth trying. GS What’s old is new again. It wasn’t that long ago, maybe the 1950s, when it was common for newly married children to live with one or another set of parents until they were on their feet. Think of the movie, “Goodfellas,” set from 1955 to 1980. JM I am glad you mentioned those days. Sometimes, I shock clients when I suggest moving back with the parents, as an option. I point out it is only a short time that it hasn’t been the norm. GS Baby boomers may be the first generation not to live at home, while she or he was getting going. JM I graduated from college in 1981. If my siblings or I moved back with my parents, it would have disappointed my father. Get out and find yourself was the message of that era. The good reasons for living with your parents after graduation are many. You can save up and you can start on a good financial footing. You won’t, suddenly, be scrambling to cover rent from the get go. Stress is a problem, in all parts of life, if you can reduce it, do it. GS What occupation, other than financial consulting, would you like to try? JM Scuba instructor or dive guide: those are my favourite pass times and I would love to do both for a living. JM Attorney, it’s by definition confrontational. If there’s no confrontation, attorneys may create some to create billings. I don’t like unnecessary confrontation. GS Is money the main reason for divorce among those less than forty years old, say. I wanted to let people see it doesn’t have to be a source of unbridled stress. There’s an easy balance of life and money. If you look for it, if you’re open it. GS You mentioned medical expenses. Do you think Obamacare will help relieve some of the financial stress? JM Yes, I do. Medical problems and the related financial stress are the number one reason for bankruptcy. I strongly suspect that in four years or so, Americans will think of Obamacare, the Affordable Care Act, as a gawd send. Nobody wants to get sick, but many worry about it. Before Obamacare, if someone got sick and had no money or insurance, she or he had few option, charity hospitals, family caregivers or do nothing. If they had savings, that money went first, before the charities would help. Now, Obamacare will cover most medical costs and thus reduce worry and stress. Fewer and fewer people will go into bankruptcy because of medical issues. More people will live longer and healthier lives, with much less stress. GS What do you want with you, all the time. JM My husband, Scott, we’re married thirty-two years. GS What’s your favourite flavour of ice cream? JM Peppermint because goes great with chocolate. It also only available at certain times of year and thus is a treat. Handling money is like going on a diet. GS Financial planning and management is as going a diet. JM That’s honestly true, people aren’t aware of their food intake until they start keeping a daily log. There’s something about the eye, hand and writing, the coordination, which makes the mind create, register information in a different, stronger way. JM I feel writing registers in a different part of your brain, where it sticks. I start to work over information in a different way, when I write it down. It’s sticker than if you only think or talk about it. GS What do you think people should write down when it comes to money? JM I have my clients write down the practical items they must pay; say, student loan, saving for a new car, rent and so forth. Then I have a client list his or her pie-in-the-sky items, the dream items, a holiday in Florence. Then we go over each item, one by one, to find a way for them to pay the needs and eventually get to the dream items. I review the financial year, with each client. Were the needs paid? What financial crises occurred? How much did they save for dream items? Now, we may revise the financial plan for the coming year or not. Sometimes, items are no longer relevant; they paid the mortgage, say. Other times, there are new items, such as a child or unemployment. We create a mind map. This is a graphic. We create a visual form of their financial planning. I’m more conservative than are many financial planners. My client base mostly work for a living, thus I incorporate their homes into the map. Their homes are their major asset. Every New Year’s Eve, my husband, Scott, and I take stock. What have we done that we set out to do during the year? What do we want to do this year and beyond? How can we put our money to work to realise those goals? Keeping a record works, in any part of life, not only handling money. The same principle can help people in any career, school, physical health or whatever. The idea is to get into the habit keeping records early in life, the earlier the better because it’s the logical way to do it. GS Do you find that once your clients have some success mapping and planning, they feel much more comfortable doing it. JM Yes, they can’t imagine not doing it. GS It removes much stress. JM It does. May through July I meet with clients about their goals, tax preparation for next year and such. I know, taxes aren’t due until April, but planning and preparing is continuing. Each year can be a fresh start. We look at where the client stands, financially. The concern is less with amounts than with balancing and staying in good shape. Mapping shows clients, clearly, how the next year should work out. It shows what will happen during the next year. They see, maybe for the first time, what’s going on beneath the surface, where their wealth is gathering. The mapping also relieves my clients of constant decision-making; it saves their financial energy. I tell clients that if they keep doing this and following the plan, here’s where they’ll be in five or ten years. The key is to get the plan to go on auto pilot. New banking technology makes auto piloting easier these days. When clients stick to the plan, even in years that are financial disasters, for the economy and most people, are not as bad for them. In bad years, portfolios drop, but those that stick to the plan see a smaller drop. This is motivating and reduces the urge to fritter money away. I’m a fee only financial planner. I’m a trustee, of a sort. I work with clients on a flat fee, no commissions. I can't sell anything and, by law, must to put client needs before my own. Many annuities pay up to eleven thousand dollars commission to the salesperson for contracts of one-hundred thousand dollars or more. Sell a one-hundred dollar annuity, earn eleven thousand dollars. The salesperson thus pushes the one thousand dollar annuity contract because that is the top commission for that product. I calculate a flat fee for the year. Clients pay me quarterly. I have no vested interested other than the well-being of the client. There isn’t any benefit to me if a client chooses one investment or another. For example, a client has one million dollars. She or he wants to withdraw all the money to open a restaurant. My job is to help them decide how to make the restaurant successful. I don’t benefit from them having a restaurant investment or any other investment. My job is to help them achieve their goals. I’m in a small, but growing, area of financial services. GS Does auto-banking help preserve financial healthiness. JM Sure, set it up, bump it up when you get a raise or come into money and otherwise forget it. Savings become invisible, stashed away before the client sees his or her pay cheque, growing all the time. It’s less stressful because auto banking helps control spending. JM French Champagne, it tastes good. GS In “Coin,” you have diagrams on budgeting for body art or its removal. JM Yes, I was meeting with some young clients. One of them, a man, had elaborate artwork on his arms. He was telling me he had no money. I looked into who gets tattoos. Roughly, half of twenty-somethings have at least one tattoo. Most have more than one, as one tattoo begets another. For much of that generation, such artwork is a norm; it is part of generational identification. Self-expression is good, but be smart about it. Plan for everything for which you’re using your money, tattoos included. A tattoo can cost ten thousand dollars. Paying that much money for anything demands planning, not only a credit card. GS What if someone wants to remove an obvious tattoo, say for career reasons. JM Some tattoos aren’t removable. Others cost a fortune to remove. So far, it seems those women and men with tattoos want to keep their tattoos. I had a client that wanted to increase her breast size, with an implant. I advised her to save for it. She had a small credit card debt and a job that allowed her to save, which she did. When she had the breast implant, she paid for it, in cash. Afterward, there wasn’t worry about debt. Delayed satisfaction meant she didn’t pay credit card interest or go bankrupt. GS In “Coin,” you mention gauges. JM Here’s another idea that helps define a generation. For my grandparental generation, it was likely smoking and drinking heavily; that was the 1920s and 1930s. For my parental generation, it was too many cocktails late in a pregnancy. Today, it’s tattoos and gauges. Gauges are form of body piercing, usually rings in ears or plates in lips. Healed piercings use gauges to expand the size of the original hole. Some people are always trying to take self-expression one-step farther. Ear gauges are most popular and obvious, I guess, although I’m starting to see more and more lip plates. For ear gauges, ten millimetres or larger is the supreme commitment, it is irreversible; a smaller gauge will likely return to normal piercing size once the gauge is removed. Paying for gauges as well as the original piercing must be part of the overall financial plan. If not, a late-night visit to a piercing salon or tatto palour might take a long time to pay off at credit card interest rates. My advice to to be careful. JM A bathing suit because means I’m near water. I love to swim. I swim laps as often as I can. Diagrams, in "Coin," are useful. GS The diagrams are effective. JM Yes, I give Jenna Kusmierek, the artist, an idea of what I wanted. Sometimes she looked at as if I were insane. Still, she’d turn my idea into the ideal diagram. GS I like the diagram, on page seventeen, about the results of about consumer debt. JM Yes, it reflects year-to-year changes in debt and income. When there’s no change or the year to year is positive, the individual is flying. When the change is negative, say forty-one per cent, as in the diagram, that’s deep trouble. Someone that loses so much ground, over one year; she or he likely has older debit to add. This is not to mention more to come as she or he tries to dig him or herself out. When the debt to income ratio, that is, debt divided by income, dips too deeply into the negative it limits your flexibility and ability to protect yourself. GS How does someone fall into so much debt? JM Divorce, medical issues or job loss can force anybody into deep debt and a financial mess. Health and job loss may be the most difficult to see coming. Other times, there’s a lack of focus and a huge debt appears. GS How does someone get out of debt so deep? JM It takes a concerted effort. It takes moving back home. It takes hard work. It means deciding to forgo tattoos or gauges, for now, at least. Most of all, it takes a reason, a motivation, beyond only being debt free. I had clients that have worked their way out of massive debt. It’s difficult. It takes time. Once they make their way out of debt, it’s not likely to happen again. The side effects of debt, such as stress and anxiety, make the price too high to pay a second time. Therefore, I suggest younger people cut housing costs, first. Find a less expensive apartment; take in a roommate or move back home. Maybe find a second job. Cut all expenses to the bare bone. If someone does this to avoid debt, he or she also avoids the side effects of massive debt. The side effects of debt include medical problems, divorce and so forth. I worked for computer start-ups in my twenties and sixty-hour weeks were common. It’s fun to have a two-day weekend, but if someone has a mountain of debt, she or he needs to work weekends. They need to take a second job, maybe a job that’s not too good, to use as a reason to get him or her out of the debt. GS If someone owes forty-one per cent of his or her salary she or he is in the financial hole. Often, spending is the issue, out of control spending. If it’s circumstance, not spending, then get support. Perhaps different forms of support are need, say, marital as well as financial advice. Always be wary of those that exchange advice for money. Check out what is available, the alternatives. Ask hard questions, of counsellors, about his or her training, experience, philosophy and so forth. In many places, counsellors do not need a licence. Anyone can hang out a shingle for financial or marital counselling. Find a licenced counsellor to help with your financial planning. JM The “Wall Street Journal” for work, I miss a lot when not reading it. GS As well as your own book, what books do you urge readers to read? JM “Defining Decade” by Dr Meg Jay; she does a great job highlighting issues that affect twenty-somethings and gets them thinking. She urges readers not waste a life, but to make life matter. Never too early to start. GS I have a friend that knows nothing of money management. He spent his life in and out of bankruptcy. Now, he’s elderly, ill and has nothing but misery. JM I guess he was never ready to receive any financial advice. The client must be ready, the pain so bad. The client must be willing to do anything to end the pain. What I found, when I first started in my financial planning practice, is I thought I could solve all the problems of all my clients. I thought I could save the world. My naiveté was disheartening. I would put together a plan. I would pour much energy and emotion into helping the client get back on his or her feet. Then I realised financial planning is a two-way street. The client would return, for a regular meeting. She or he had done nothing I suggested. In fact, many were in worse shape than when we first met. The client would say, “Well, we decided to take the kids to San Diego for the weekend. We’ve been working hard. Everyone needed a break.” With the fun weekend holiday went thousands more dollars on to the credit card; money they didn’t have, couldn’t afford to repay. My jaw would drop. This happened repeatedly, with many clients. From this experience, I realised there had to be a pain threshold the client crossed; else, she or he usually didn’t follow through. GS Bach is famous for advising readers to give up Starbucks or whatever coffee shop they visited daily. JM Yes, but nine-out-of-ten times, the client would not read the book or return to see me. If a potential client was not in enough financial pain to read the book, I could not help them. She or he wasn’t ready to go to work on his or her financial health. GS Say a client read Bach; took his advice, gave up Starbucks and such. JM He or she could make coffee at home. The yearly savings would be at least seven hundred dollars, after investing in a home coffee maker and k-cups or some such from a box store that sells in bulk. Starbucks profits from coffee, of course, but mostly from the overpriced food items and specialty drinks, which many customers buy each day. GS I have an older friend that buys a ten dollar drink at Starbucks each day. HM Whew, that’s $3,650 a year. I have clients, a couple, in their late seventies. They didn’t plan and lived through some unfortunate life circumstances. Now, money is tight. They stretch every dollar and squeeze every nickel. They moved to a series of smaller and smaller apartments. Rather than sit at home, watch television, sulk and, maybe, argue, they look for entertainment that costs them nothing. Senior’s day, say, at a museum, concerts in the park, walking trails and so on. GS That might not be a bad way to live, whatever your age. JM Yes, it’s a balance. They keep livings costs down enough that, if they want, they can take a short holiday, occasionally, maybe go back east to see their grandchildren. They can’t travel every year, but maybe every five years. JM Coins, I have coins from every country I visited and as souvenirs given me by friends. My husband, Scott, built me a custom desk. In the middle of the table top, of the desk, is a rectangular window. Through the glass pane, you can see my coin collection on a shelf. Leasing versus buying a car. GS Can we talk about leasing versus buying a car. JM Yes, many people think they get more of a car on a lease than a buy. My question is do you need a car, at all. If yes, how much of a car do you need? For young adults, many don’t need a car. They don’t need to tie their identity to a car, though many do. Most young adults can’t afford such luxury. Rent and food are more important, I would think, than high status displayed through a fancy car. GS Scale back your identity. JM Yes, more of a car than needed means paying less rent, brown bagging your lunch and so forth. More balance is important; less fancy a car means a better apartment and so forth. The client must decide what’s most important to her or him. GS Are you suggesting a used car, not a new one. JM Either a used car or buying a less expensive new car. A car that doesn’t have all the bells and whistle than you might get for the same money with a leased car. The idea is balance. Buying or renting a home. GS Do you advise buying a home, including stand-alone houses and condominiums, if you can or renting. JM I advise younger clients to wait a little before buying. The transaction costs, involved in buying a home, raise the needed funds. A client may qualify for a mortgage and earn enough to pay the monthly costs, but the transaction costs can sink them. Most young people, today, don’t know where they will be, geographically, in, say, five years. Buy a house too young and job opportunities, say, may not work out, as packing up and moving is more difficult. If you want to return to school, how do you pay the mortgage? If you find yourself in a long-distance romance, how does owning a home, with a mortgage, affect that? Also, there are television shows that suggest certain viewers are eligible, say, for a two-hundred thousand dollar mortgage. Older folks buy a huge home they don’t need; twenty-three year olds buy homes with granite counter tops in the kitchen and so forth. These shows push viewers to take out the highest mortgage that they can get, which usually doesn’t work and they default. The push is to buy the most home you can afford, just as leasing, not buying, a car. It doesn’t matter if you need and want a one-hundred and fifty thousand dollar home, the push is to buy the larger home, say, because you qualify for the mortgage. There’s much greed in the advice offered on such television shows. I advise young folks to rent for a year or two. They get a financial footing, during this time. They don’t have to worry about home maintenance, such as cutting the grass or shovelling snow and the issues, such as insurance or furnishings, which go with home ownership. They can rent and have fun for a few years. When they decide they’re ready, they can settle down. Again, the client must decide when the time is right. GS You believe that buying a home is important. JM At a certain point, yes, home ownership is important. There are tax credits, in the US, for home owning. For example, itemising deductions may reduce the cost of a mortgage from 3.5% to 2.5%. A home is great protection against inflation. It helps build wealth, if you buy the right home, for the right price, at the right time. As long as you own real estate, it’s protection against inflation. Some people may not want the hassle of home ownership. If you don’t live in the home, but you own it, I think that too is fine. GS You’re amassing wealth and someone else is paying for it. JM Right. As I mentioned, there are many incentives for home ownership in the US. Renting cuts into your ability to build wealth. At some point, it makes sense to diversify your holdings and build wealth, which owning a home eases. GS Home ownership is a huge part of the American value emphasis. GS The emphasis on ownership is not as strong elsewhere, say, France or even Canada. JM In part, I think this might explain the willingness, among Americans, to have little or no equity in their homes. I advise my clients to keep twenty-to-fifty per cent equity in their homes; one hundred per cent equity is not necessary. If inflation hits, you repay the mortgage with cheaper dollars and so forth. GS Suppose someone, a little bit older, has a home paid off. Would you advise him or her to mortgage the house and invest that money elsewhere? JM Yes, I did that for a few of my clients, a few years back, when interest rates first plunged in the US. Then, with dumb luck, we had a bull market. Their wealth soared; it worked out well. GS You don’t find some of the cyclic nature of the economy predictable. JM Yes I do. When I was advising a few clients, with full home equity, to mortgage and invest, I was nervous, but trusting of the cyclic economy. There’s always a chance the predictable won’t follow through. Usually, I’m conservative. I try to set expectations in a reasonable range. If the risk works out, the returns are good; if not, maybe the hit is not too hard to take. JM Waterfalls, water waves, the ocean, these are my favourite sounds. 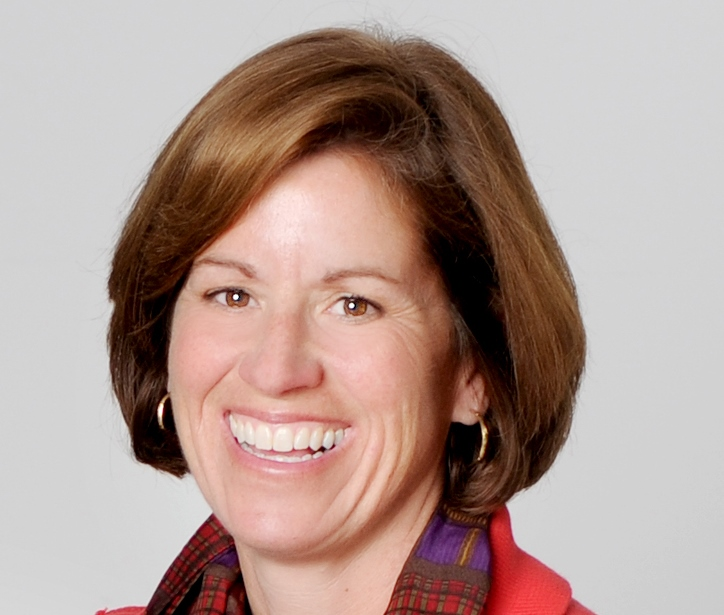 The role of a financial planner. GS How do you see your role, in the largest sense? JM I try to provide hope. Debt is overwhelming, preoccupying. You can own a hope, such as a home, if you plan and then make the move at the right time, in the right way. Years from now, you can retire securely, comfortably, by starting to plan when you’re young. GS I think you’re saying self-control is a key. JM Yes, self-control has a huge effect. In the US, about fifty-two per cent, of young adults, report a comfortable understanding of personal finances. Half of these young adults report this understanding came from their family. JM To improve awareness of financial planning, we need to reach families, not only young adults or recent college graduates. Through the family, we can prepare young adults for what to expect and what to do, once they graduate. Few college graduates will feel left out to dry. Money needs to be a normal topic or issue, not a punishment or a reward to the extent it is now. Ideally, families can have conversations about money. They can talk of financial planning and so forth, which will help young adults. If this is the family practice, there’s less emotion attached to deciding a certain holiday or fancy car, say, is not part of the budget, right now, maybe later, after saving for it. Money is a tool. Decide how to use it, wisely. Decide what money can do for you, now and into the future. Strive for self-control, when it comes to money. Delay satisfaction until a tattoo is a cash payment, not more credit card debt. Decide. GS For families conscious and controlled about handling money, it comes easier for young adults. JM Yes, otherwise, financial planning and management is a strange new world, difficult to navigate, at least at first. There are many traps; too much unfettered temptation to leap for offers that are too good to be true. Self-control is the key. GS As well as books, such as “Coin,” or the few sane television shows about financial management, say, “Suze Orman,” how does a recent college graduate learn to manage his or her money, well? JM Today, there are websites that help men and women learn money management. There are blogs. There’s talking about responsible financial management with friends or family. GS How do you spark young adults, anyone, to seek these sources? JM Well, I think it’s the decision not to be in debt, for example, that motivates women and men to seek help. Until someone decides she or he wants to get out of debt or buy a home, for example, he or she won’t accept help, let alone seek it. Everyone needs to ask if her or his financial circumstance must be as bad as it is and how can it get better. The spark leads to putting in more time to discover what’s possible. Recent college graduates, in a new job, are building lives. The first step may be a new circle of friends; going out, as a way to bond with others, and trying to act as adults. After this stage, they decide to think ahead. They want to marry, perhaps, set up to buy a home, save emergency expenses or retirement, say. Right out of college is a major transition period, when it ends, another starts and that’s where I might enter the picture. I think the recession and the challenges recent graduates had finding employment are influential. I don’t think there’s a family, in the US, that hasn’t had someone lose a job and not find another. It’s a degrading experience. I suspect not many recent college graduates want to live through such a time, themselves. There are fewer and fewer jobs in the US, today. Employers are offering fewer and fewer benefits to those lucky enough to find a career entry job. Thus, everyone must take personal responsibility for the future. GS Serial employment is increasingly what’s available. JM Yes, recent graduates, in a way, expect to be in this job for two years before they move on to another two-year job. You lose benefits or benefits never started because they weren’t on a particular job long enough. They must take personal responsibility for their future. In "Coin," I want to create awareness of what the future looks like and the dire need to take personal financial responsibility. I work with student-related associations, such as sororities and fraternities, to increase awareness among young adults. I give workshops and such. If I can spark one or two people, here and there, I’m successful. Not everyone is paying attention. My goal is to spark those that are aware as young as possible. GS Have you thought of starting to develop awareness of personal responsibility in high school. JM There’s timing to consider. I don’t care about a mortgage if I’m never going to own a home, which is what a high school student mostly thinks. I don’t care about retirement if I’m seventeen because it is fifty years or more away, if at all. JM In Colorado, where I live, a one-semester course in personal finance is now compulsory in high school. It bums me out, though, that teachers have students play the stock market game in many of these one-semester high school courses. Part of these courses should deal with student loans, how to finance a college education, budgeting to save and so forth. Budgeting, the idea of living on less money than you earn, might work for high school students. Many sixteen year olds have part-time jobs, full-time, maybe, during the summer. If they follow a budget, they could leave high school with a nest egg. Maybe these courses can involve parents. If the parents aren’t planning, high school students won’t find it import to start planning. He or she sees the parents as doing okay and says, “I will, too”; of course, the student doesn’t have all the information about family finances. GS I recently read that undergraduate tuition at Princeton, for 2014-2015, is more than sixty-four thousand dollars. If a family is not dripping in money, attending a prestigious college calls for much planning. JM Yes, but many top public, state and city colleges are also inexpensive. Are you willing to incur a mountain of debt for the prestige of graduating from a well-known school? Does the quality of undergraduate education vary that much from a public college? Will an extra one hundred thousand dollars in student loan, just for going to a name private college, pay off? GS I can tell you it doesn’t. What is something about you that would surprise readers? JM I own a Selmer Balanced-action e-flat Alto sax. I play it for years. I was in band and practiced almost daily. To raise my children, I left the sax behind for a while. A few years ago, my children grown, I decided to try the sax, again; that did not go well. GS It’s the gold standard of saxophones, especially e-flat Altos. GS Although not for the recent college graduate, commercials for reverse mortgages are all over the place. What do you think of the idea? JM The idea is good, but I have yet to see it work well in practice. I have looked into reverse mortgage for clients. The fees are huge, far too expensive; it made sense to sell the house and put the money elsewhere. There are also many strings attached to a reverse mortgage. Sometimes a surviving partner can stay in the the house, other times not, without incurring additional debt. If one partner must go to aided living, can the other partner stay in the house? Sometimes the answer is yes, other times it is no. Once the costs and conditions sort out, more thoroughly, the idea of a reverse mortgage may fly. Many baby boomers are cash poor, with great equity in the home and a reverse mortgage might be a windfall for them. My position is this is an idea with much promise, but it needs much more thought and, perhaps, more enforceable rules. GS Is there a mistake you made, when you began as a financial planner, which you now regret. JM Yes, I thought I could help everyone. I soon discovered, in a hard-learned way, no one can help everybody. Before a client walks through my door, she or he must decide if they’re ready for financial responsibility; surprisingly, not everybody is ready to take control. Click here to watch the Judy McNary video. Click here to buy "Coin," by Judy McNary.